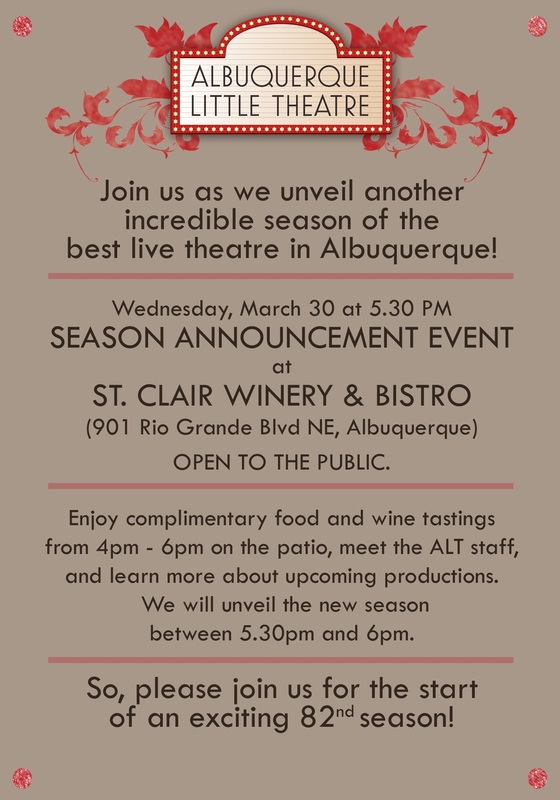 Albuquerque Little Theatre will announce its upcoming 2011-2012 Season on Wednesday, March 30 at St. Clair Winery. Media and the public are invited to attend a complimentary food and wine tasting at St. Clair’s Winery & Bistro from 4pm – 6pm. Albuquerque Little Theatre Staff and Board members will be on hand to unveil the upcoming season from 5:30pm – 6pm. Albuquerque Little Theatre is currently enjoying the most successful season in its history with productions such as Chicago, White Christmas, Steel Magnolias and Hairspray. “We appreciate our patrons and wanted to find a fun way to introduce them to our next season. We hope that folks will join us on their way home from work and share in the exciting news,” said ALT Executive Director Henry Avery.